Potholes are creating headaches for Washington State motorists. After a wetter-than-normal winter, Spokane’s streets are pocked with potholes. But city officials are reassuring motorists they’re aware of the situation and are doing their best to fill the pavement blemishes as soon as possible. As of March 30, road crews have filled approximately 2,750 potholes that line Spokane’s highways and byways, according to city data collected by local news station KHQ. Given the freeze and thaw cycle of weather, which creates the crevices in the first place, pothole predicaments are not only common, but in fact never let up. However, they seem worse than normal this year, many Washingtonians say. Potholes develop naturally over time due to the wear and tear of excessive road use, but they’re particularly numerous in climates that experience major temperature swings combined with inclement weather. When precipitation collects and it’s cold out, the water freezes and expands. It eventually dissipates after warming up, but the constant freeze-thaw cycles take their toll, wearing away asphalt on a slow but steady basis that motorists can both see and feel after driving over them. Kennewick’s Evelyn Lusignan told KEPR TV that road crews have been on the pothole case since the snow melted, filling more than 1,000 of them and counting. “Some of those are repeat fills and [serve as] temporary patches,” Lusignan stated. The short-term nature of these fixes are part of the long-term problem, though. Lusignan pointed out Kennewick’s roads are in dire need of repair, but the city is fully invested in getting the roads back in tip-top shape. “We have a consultant that’s doing a rating system and we’ll have a database of all of our arterials and collector streets and residential streets and they’ll all be rated on their condition,” Lusignan told the news station. Approximately $500,000 in spending is going toward the much-needed renovations, KEPR TV reported. Still, city officials in Spokane and Kennewick are relying on the public to inform them of new or developing potholes. This can be done by dialing 3-1-1, KHQ reported. The City of Spokane says it can take up to 48 hours for the potholes to be assessed and filled, depending on their size and the roads they’re located on. Potholes are much more than a cosmetic issue, as the jarring nature of them can result in damage. 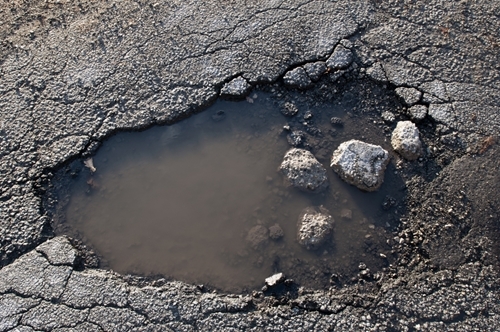 According to a poll done by the trade group Independent Insurance Agents & Brokers of America, approximately 50 percent of respondents have experienced vehicle damage from potholes. All too often, motorists focus their gaze directly in front of their vehicles. The problem with this is it prevents you from implementing the appropriate course correction measures. Keep an eye out for what’s ahead so you can adjust the steering wheel accordingly. You should always stay at least two seconds behind the car in front of you to avoid an accident should the driver stop short suddenly. But this strategy also allows you to locate potholes that you may not be able to otherwise. A common mistake is jerking the wheel moments before hitting a pothole. This is a potential safety hazard because it risks veering into the other lane and may lead to a chain reaction if drivers behind react similarly. Instead, safety experts recommend driving through the pothole if the only other alternative is swerving.